The case of Army Private First Class Bradley Manning could be among the most significant military cases in US history; Manning is being accused of releasing sensitive information that has comprised the safety of America to the whistleblowing site WikiLeaks. Although some call him a traitor, others see the Private as a hero. Manning’s attorney David Coombs has remained silent when it came to speaking out about the trial to the media until Monday night. RT’s Liz Wahl has more. The attorney representing Bradley Manning, the U.S. Army private accused of releasing military reports to WikiLeaks, made his first public speaking appearance on Monday. Army PFC Bradley Manning’s civilian defense lawyer, David Coombs, spoke to an audience in Washington D.C. on the alleged “unlawful pretrial punishment” that PFC Manning was subjected to for nine months while at the Marine Corps Base, Quantico, Virginia. He also provided an overview of the defense motions before the court and other facts regarding the U.S. v. Manning case. The event follows a major pretrial hearing for Manning at Fort Meade, MD, from November 27 to December 2. At last week’s pretrial hearing, Coombs moved to dismiss all charges with prejudice based on Manning’s treatment. The government’s alleged denial of PFC Manning’s right to a speedy trial is also before the military court. 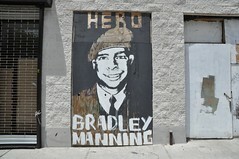 The event was hosted by the Bradley Manning Support Network, which is responsible for Manning’s legal defense expenses. This entry was posted in All Posts News Politics and-or Videos, Dandelion Salad Videos, Justice or Injustice, Politics, Torture, Torture on Dandelion Salad and tagged Chelsea Manning, David Coombs, Manning-Bradley, Michael Ratner, Ratner-Michael, US Cables Leaked from WikiLeaks, WikiLeaks. Bookmark the permalink. Bradley Manning’s trial is actually the US on trial. This young man has acted entirely from principle. Can the same be said of the President? Who is a man directly responsible for the calculated death by remote control of many innocents? In what court is he answerable and therefore accountable for his actions? Certainly not the ICC, possibly only before the court of public opinion. This case is arguably the most important moral watershed and legal benchmark in the history of US jurisprudence.